String beading wire through a crimp bead, through a jumpring and back through the crimp bead. Crimp the bead to secure the wire. Add the following Swarovski crystal to the wire: 3 Crystal Cream Pearls; 1 Bead article 5500 Violet; 7 Crystal Cream Pearls; 1 Crystal Lavender Pearl; 7 Crystal Cream Pearls; 1 Bead article 5500 Peridot; 3 Crystal Cream Pearls; 1 Butterfly Bead article 5754 Sunflower; 3 Crystal Cream Pearls; 1 Tierra Cast Bunny Bead; 3 Crystal Cream Pearls; 1 Butterfly Bead article 5754 Sunflower. Repeat step 2 once using different color Swarovski Beads 9x6mm and Crystal Pearls 11x8mm. Add on 3 Crystal Cream Pearls; 1 Bead article 5500 Tanzanite; 7 Crystal Cream Pearls; 1 Crystal Lavender Pearl; 7 Crystal Cream Pearls; 1 Crystal Lavender Pearl. Repeat step 1 to finish necklace. Open jumpring and add lobster clasp. Close jumpring securely. 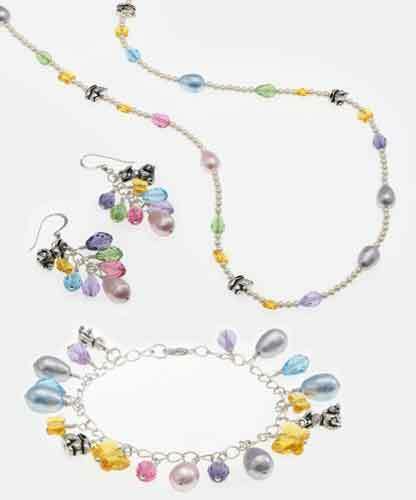 String all Swarovski crystal and the one Tierra Cast Rabbit Bead onto headpins. Attach a 6mm jumpring to each of the Tierra Cast Bunny Charms. Wire wrap the headpins on every other link of the chain and cut off remaining wire. Attach the bunny pendants to the chain with the jumprings. You can follow the pattern in the picture above or attach them in a random order. Attach the lobster clasp to one end of the chain using the 3rd jumpring. Close jumpring to secure. Cut chain in two equal pieces. Open loops on bottom of French earwires and attach one earwire to each piece of chain at the last link. Close loop of earwire to secure. String all Swarovski crystal onto an individual headpin. Open the two 4mm jumprings and attach one to each of the Tierra Cast Rabbit charms. Attach to the top link in the chain near the earwire. Close jumpring to secure. Attach the Pearl headpin to the bottom link of the chain, forming a loop in the headpin and wire wrapping the headpin to secure. Repeat for other Pearl headpin and other earring. Attach remaining beaded headpins to links in chain in random order or follow the pattern as seen in the picture above. Secure all headpins the same way that you secured the Pearl headpin in step 4.